This blog is about Groucho, our fearless, bewhiskered, blessed with a wonderful sense of humour, who, thanks to the wonderful Westie Rescue (www.westierescue.ie) we were able to adopt and he is now our much loved Four Legged Family Member. 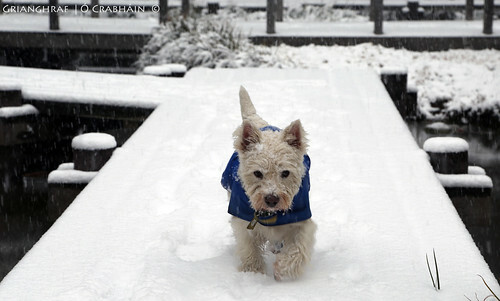 We hope you enjoy reading about his adventures and his Westie view on life! Well, it's another quick post - thank to you all for your welcome back messages but it looks like it was a short lived return to Blogville, She is back at the mad long hours at that horrible thing called Work. 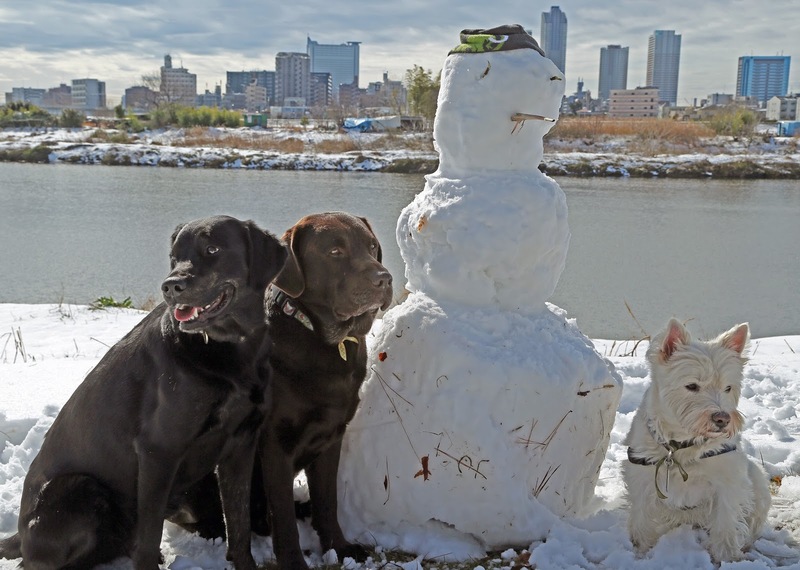 But I had to share this - these are my two buddies, Heinrich and Mathilde - I met them out walking along 'my' river (that's it, in the background - who'd have thought, here I am, living in Tokyo and I have this cool river to run along every day!!!) and we are the best of buddies now. She says Heinrich is the coolest four legged one (not as cool as me, obviously) and Mathilde makes us all laugh as she loves to dig - and while she has her head stuck in a hole, I run up to her and lick her ears. Heinrich just moseys on along and let's us have play fights with him, he's very gentle with me even though I can be a bit of a brat (apparently, although I would not agree with this of course, that's just what She says). Anyway, I have to go. By the way, this snowman was not made by Her, She grew up in Australia so what would She know about snowman building???? H & M he two legged one built it - he was very fast at it (extreme snowmanning we have called it) but then, he grew up in a snowy country so of course he knew what to do!! And apologies for not being able to visit y'all blogs, we'll make up for it in a few months time, She has promised!!!! Snow Mobile, originally uploaded by Wonder Westie. Well, don't fall off your chairs, yes, it's Me, I'm back Again!!!!! I can only say I'm very sorry on behalf of Her, I haven't been able to make comments on any of your blogs, but I'll be back in a few months time, She's having a break and one of the first things She is going to do is become a Consistent Blogger - or allow me to be one!!! Anyhoo, we had a BRILLIANT snow storm this past weekend - the most snow in Tokyo in 45 years!!!! OMD, it was PAWSOME!!! I had soooo much fun, I bounced and I jumped and I made SnowGrouchos and I ate snow and I ran and I ran and I ran.